Talks of alien existence and encounters have been in the air for a long time now. Many stories and incidents have come to the forefront over the years. While some of them are under research, most of them are believed to be hoaxes. However, when did it all really start? Was it only a few decades ago that people started witnessing alien activities or was it long before that? In reality, many alien activities can even be dated all the way back to ancient Egypt. Intrigued yet? Here we explore a few popular theories! In 1933, the Vatican Museum’s Egypt director Alberto Tulli was in Cairo, working in the field. One day while passing an antique shop, he spotted a piece of ancient papyrus which appeared to date back to about 1480 B.C. Unfortunately, it was a bit too expensive for him so he opted to copy it down instead. While doing this, he discovered a story about a circle of fire in the sky measuring 100 cubits across (about 150 feet, or 46 meters). It stated that as days went by,, the circle only got larger as it was joined by others until “their splendor exceeded that of the sun and extended to the limits of the four angles of the sky.” Finally, it rose into the upper atmosphere and disappeared. At this point, the Pharoah had incense burned out of respect for the bizarre occurrence. This is one of the most dramatic UFO sightings from the ancient time. 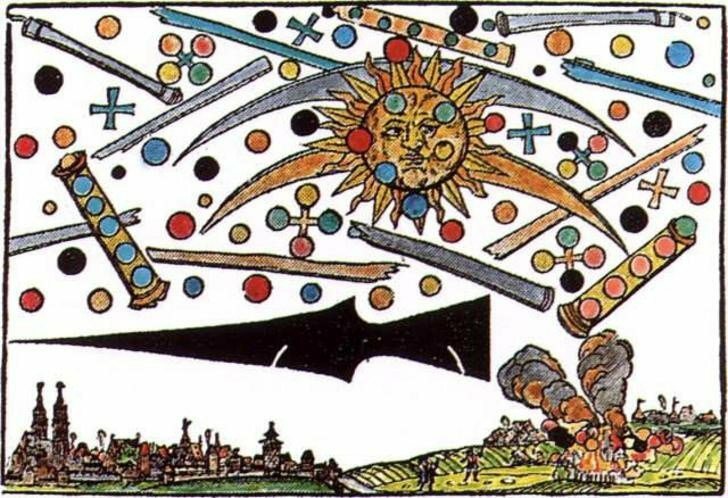 In 1561, the skies of city of Nuremberg, Germany featured two blood-red arcs in front of the sun. As the hours went by, the arcs were joined by several spinning rods, and eventually, a massive black spear. The story spread far and wide, but it wasn’t really associated with UFOs until Carl Jung published “Flying Saucers: A Modern Myth of Things Seen in the Skies” in 1958. Ironically, he was attempting to show that the delusion of objects in the sky had been around for centuries, but only succeeded in convincing more UFOlogists that the truth had been out there since the Middle Ages. In 1896, the United States was under attack from above. On November 17, George Scott, an assistant to California’s secretary of state witnessed something unusual from the observation deck: three lights in the sky, slowly approaching his position. As it got closer, he saw that above them was an oblong shape. He wasn’t the only one to spot such a device. The same day, former railway employee named R.L. Lowery also saw one and even spoke to its pilot. He looked up to see a pair of human men(apparently) pedaling a bicycle-like device attached to a long, cigar-shaped object. More sightings followed on the East Coast the following year, and another wave of sightings hit the country in 1909. Yes, a lot of alien stories and pictures have come to the forefront. And yes, the above stories could be a part of the list of hoaxes we’ve had till now. However, the difference is that these stories are quite a few years old and while it is easy to create an alien hoax with the technology now, it would’ve been a lot tougher earlier. So was it aliens, a mass hallucination, or a time traveler? With each theory more mysterious than the previous, we can only speculate at this point of time. Noted UFO researchers DR. Jacques Vallee and DR. Pierre Guerin, believe the UFO phenomena is more in tune with the occult than physics. They’ve stated; “reports of alien activities suggest more of an attempt to change our belief systems.” Interesting, because neither of these men express any kind of religious belief. Noted UFO author, Whitley Strieber who claims to have been contacted by ETs said this; “Increasingly I felt as if I were entering a struggle that might even be more then life-or-death. It might be a struggle for my soul, my essence, or whatever part of me might have reference to the eternal. There are worse things than death, I suspected… So far the word demon had never been spoken among the scientists and doctors who were working with me…. Alone at night I worried about the legendary cunning of demons…. At the very least, I was going stark, raving mad.” Whitley also claims no belief in any organized religion. Don’t be deceived by the claims of them being our space brothers, or earth’s progenitors. It part of Satan’s endgame plan. Turn to Christ, put you faith in Him and His perfect sacrifice at Calvary alone. Ask Him to forgive you, give you new life in Christ, and the gift of eternal life.